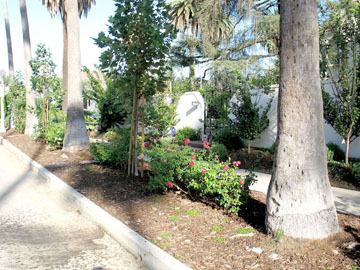 UNPERMITTED ROSES and not-approved street trees present barriers in this parkway in Windsor Square, top. A close-up of the offending plants is below. Last month, the Larchmont Chronicle reported on homeowners replacing front yard lawns with more drought-tolerant landscapes. The following describes some of the challenges homeowners have experienced with respect to landscaping their parkways. Challenges confront property owners wishing to improve their parkways to address Southern California drought conditions. The first challenge is obtaining city permission to do anything within the parkway. Two city agencies have jurisdiction. The Public Works Department’s Bureau of Engineering oversees parkways, and the Bureau of Street Services Urban Forestry Division (UFD) oversees street trees within the parkways. Residents report significant ordeals in dealing with the bureaucracy, trying to follow the law. Some property owners have just let anarchy be their guide and have proceeded without regard to the permitting process. Because of concerns about pedestrian and emergency responder access from the street to the sidewalk and the buildings beyond, it long has been illegal to block parkways in Los Angeles. Such impediments can be structures or plants. The Bureau of Engineering and UFD websites set forth the applicable rules. Yet, some homeowners assume that they can do whatever they wish with the landscape in the city’s parkways adjoining their homes. Either that, or they know there are rules or that a permit is required but proceed without one, figuring they won’t get caught. Not getting caught is too often the result, because both the Bureau of Engineering and the UFD say that they do not have the personnel resources to enforce the laws under their jurisdictions. Speaking of the dilemmas involved in trying to re-landscape the parkways, local garden designer Judy Horton told of trying to address the drought by removing parkway turf and replacing a dying parkway tree in Windsor Square. The dilemma, she said, was that the dying tree was a non-native species that consumes large amounts of water. However, the street tree plan for that block on Lucerne Blvd. specifies only one tree, a magnolia. 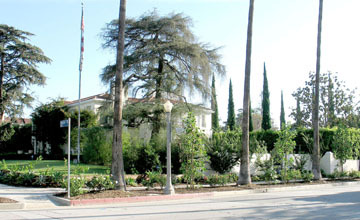 Parkway landscaping rules are set forth in a June 22, 2015, revision to 2010’s original “Residential Parkway Landscaping Guidelines” produced by Public Works with input from the DWP and various civic groups, including TreePeople. The guidelines are 10 pages long and are readily available online. They provide an exception from general permit requirements for landscaping parkways in single-family residential zones . . . provided that the property owner complies with the guidelines, which specify preferred species of turf and drought-tolerant turf alternatives. There are 23 preferred species in all, with 10 of those being drought-tolerant turf species. The exemption does not cover trees in the parkways. “Permits are required to plant, prune, or remove any tree in any street in the city,” the guidelines reaffirm. Next month, the Larchmont Chronicle will focus on watering trees, plus take a look at the Getty House drought-tolerant parkway after its first year.